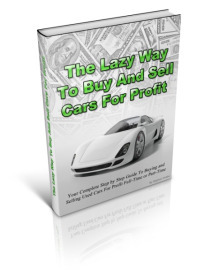 Free report: 5 Easy Ways To Make Big Money Buying and Selling Used Cars! This guide will show you how to make profit by buying and selling used cars from home. Used car business is well known money making strategy. My neighbor was a bus driver and he was making a very nice profit from buying and selling used cars. In those days Internet wasn’t so widespread, so people were advertising used cars in newspapers or they would bring them to fairs. Now-days, people search for used cars on the Internet, as with almost everything else. The first issue you may think of related to the used car business is a car dealers license requirement. But the author offers to show an easy, affordable and totally legal way to run this business without it but with all the advantages of having it. Author shares his experience in the used cars business and how he managed to achieve his easy living dream after three years of buying and selling cars for profit. As Stephen Hobbs claims, this is not a quick money guide. It will take time and effort before you start to make really good money. I would certainly agree with this, but that kind of diminishes the meaning of the “lazy way” term in the product title. Another issue that people may have with the used cars business is that they presume they will need a lot of money to start it. As Stephen shows from his example, $400 was all he had to start. He gives some examples when he bought cars for as low as $50 but don’t think of trying this business if your resources are so limited. There are another 11 myths related to the used cars business that Stephen Hobbs shares on his page. and a lot more topics that are covered in this 146 pages long e-book. # Sure Fire Secrets To Raise Cash Now! # Get $1500.00 MORE When Selling a Car! # Free Email Consultation For 6 Months!